Some of the technology to power Apple's rumored smartwatch is in development at longtime supplier Foxconn, according to a new report, and the Taiwanese company isn't just making the technology for Apple. The Wall Street Journal carried a report on Sunday backing up an earlier report from the New York Times that Apple is working on developing a smartwatch device. In exploring devices beyond its currently hot-selling iPhone and iPad, Apple is said to have discussed a smartwatch with Hon Hai Precision Industry, also known as by its U.S. trade name Foxconn. Foxconn is said to be working on multiple technologies that could appear in wearable technologies. The Taipei-based company is looking to lower power-usage and to strip down the chip technologies that would go into such devices. In particular, the report claims that Foxconn is working on the underpinnings of wearable technology for more customers than just Apple. The Journal does not detail for which other companies Foxconn might be developing the components. Google is known to be working on its own wearable technology, a glasses-mounted heads-up display known as Google Glass. That device is currently in testing with developers, and Google has targeted early 2014 as a consumer release window. Shortly after Google Glass was unveiled, an Apple patent emerged, showing off similar technology aimed at solving issues arising from such displays. 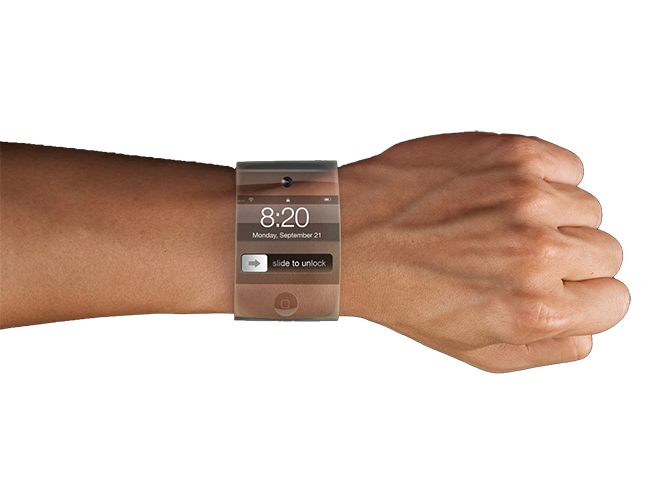 Many industry observers believe that "wearable" computing is a near-inevitable next step for mobile technology. In January, Piper Jaffray analyst Gene Munster predicted such technology would ultimately replace the iPhone, much like the iPhone has replaced the iPod. Apple is likely to leverage its existing patents on creating curved glass to bring to market a product its competitors could not quickly and easily imitate. Such a device might also intermittently satisfy Wall Street investors, who have pummeled Apple's stock in recent weeks due to concerns over competition, and possibly plateauing profit growth and innovation. The Journal was the second major news publication on Sunday to leak details on a possible Apple smartwatch, lending credence to the notion that such a device is in development or at least under consideration. 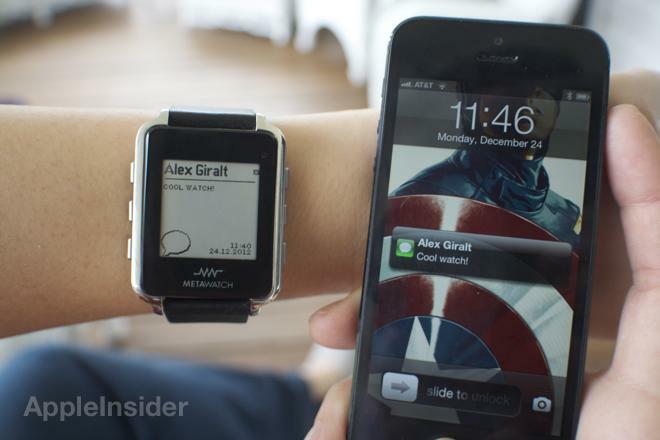 The past months have seen increasing speculation on the existence and capabilities of an "iWatch." An artist's rendition of a curved glass iOS-based watch | Source: unknown. In December, rumors emerged that Apple was working with Intel on a smartwatch accessory that would feature a 1.5-inch OLED display and low-power Bluetooth 4.0 connectivity. That device was said to work alongside a user's iPhone, with the ability to access simplified iOS functions. And just last week, prior to the New York Times and Wall Street Journal reports, Bruce Tognazzini opined in long-form on his blog about the possibilities of an iWatch. Tognazzini  creator of Apple's Human Interface Guidelines  based his predictions on his knowledge of the way Apple operates, saying an iWatch would "fill a gaping hole in the Apple ecosystem" and would complement all of Apple's other devices. Apple is notoriously secretive about products in development. Chief Executive Tim Cook, during Apple's most recently quarterly conference call, would say only that Apple's product pipeline is "chock full" of "incredible stuff," but that Apple would only reveal its plans when the company feels the time is right.